“Aguacate…Aguacate!” A street vendor’s voice rang out, echoing down the winding colonial streets of Barrio San Antonio in Cali, Colombia. Every morning the vendor would wheel his cart overflowing with avocados as large as your face down the streets. You buy avocados in Colombia they way your buy a baguette in France, direct from a vendor and fresh, daily. Paired with salt and lime they were my go-to snack in Colombia, though they were filling enough to be a meal. Colombia is dripping with an abundance of fruit. Mango and lime trees are at every turn with excess fruit spilling on to the sidewalk and filling the shelves of every tienda. Cali is a city snuggled in the Cauca Valley, bordered by a mountain range in the West Andes. 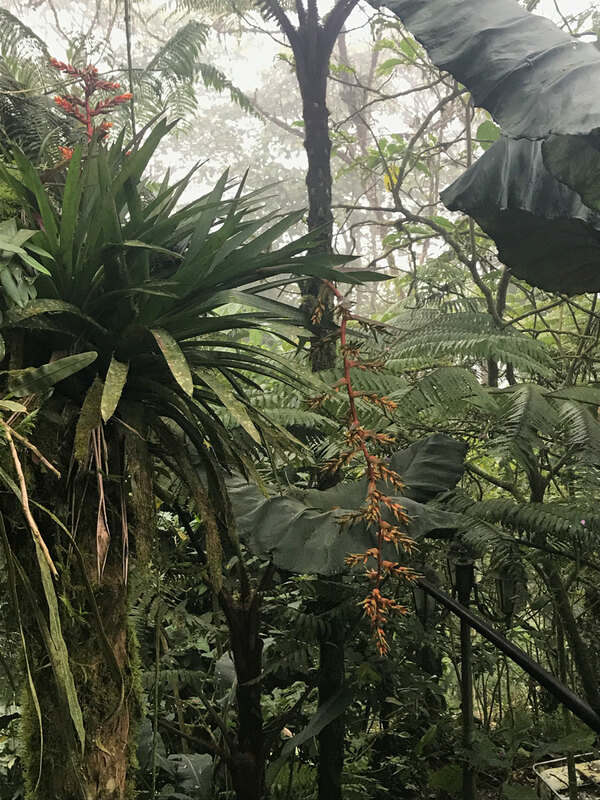 At over 3,000 feet elevation, the tropical valley has the benefit of being temperate year-round, and the architecture of homes and businesses make the most of indoor/outdoor spaces. Unassuming facades with colorful doors and window treatments hide stunning interior gardens that would rival any Greek courtyard. 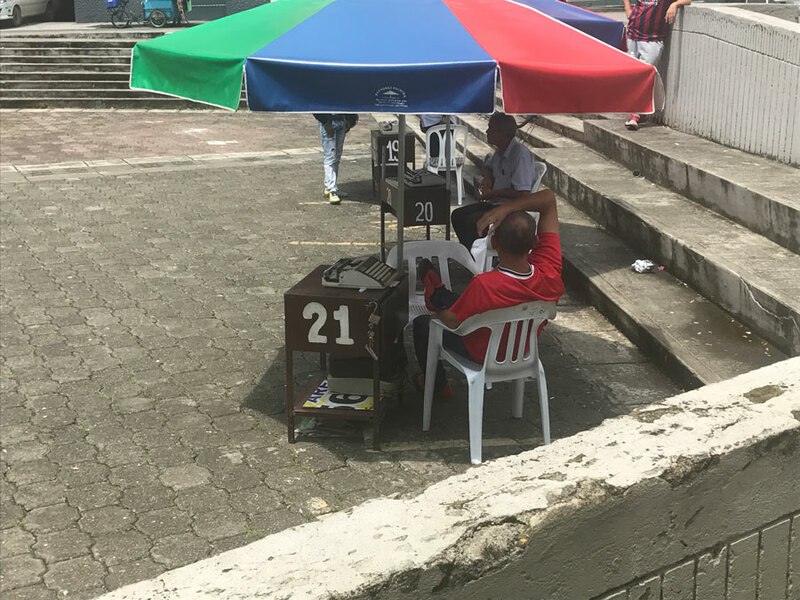 As the street vendor’s call becomes more distant, I begin my day with eggs and coffee and start work under the shade of a Monstera plant. I am visiting Cali on assignment with USAID’s Partners of the Americas, Farmer to Farmer program. The organization pairs American volunteers (typically farmers) with farmers in developing regions of the Americas for a cultural and professional knowledge exchange. The company I am working with in Colombia, Zue Beauty, has previously hosted technical and agricultural volunteers that have helped the start-up train indigenous farmers from the Paez tribe to harvest ingredients that become the foundations of their products. Zue Beauty makes a line a skin care products like facial scrubs, toners and creams, but the mission of the company is much greater than that. The Paez live in a remote mountain jungle region. As farmers, they have been harvesting coca leaves (the basis of cocaine) for centuries and make it into a mildly stimulating tea. 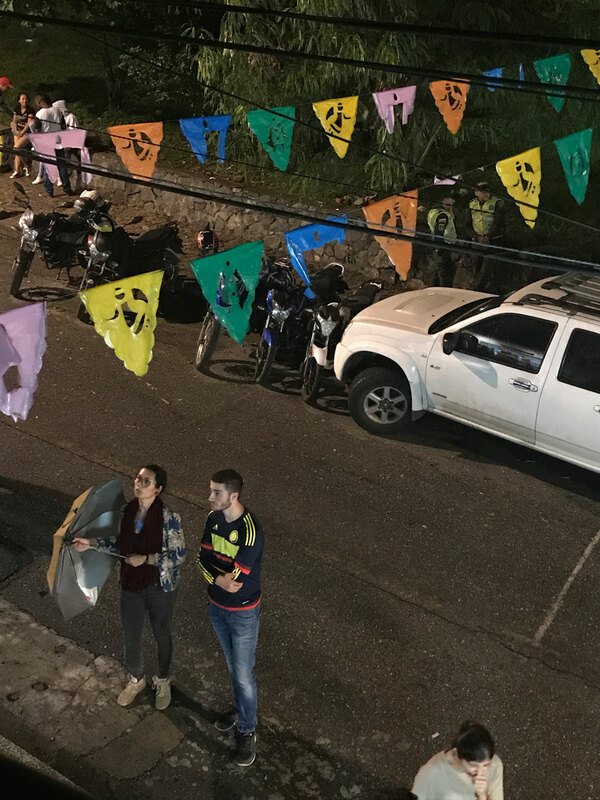 But for the past decades, they have been forced to contend with the presence of the FARC rebel force in addition to the drug traffickers and cocaine refineries invading their region. Before long, drug traffickers took control of the coca production, seducing the impoverished communities who were surviving on subsistence agriculture. Bill Clinton’s “Plan Colombia” in the 90s launched a campaign to eradicate and substitute the crop and included military interference. Since 2015, a new agreement called, “Peace Colombia” continues to provide Colombia with aid. 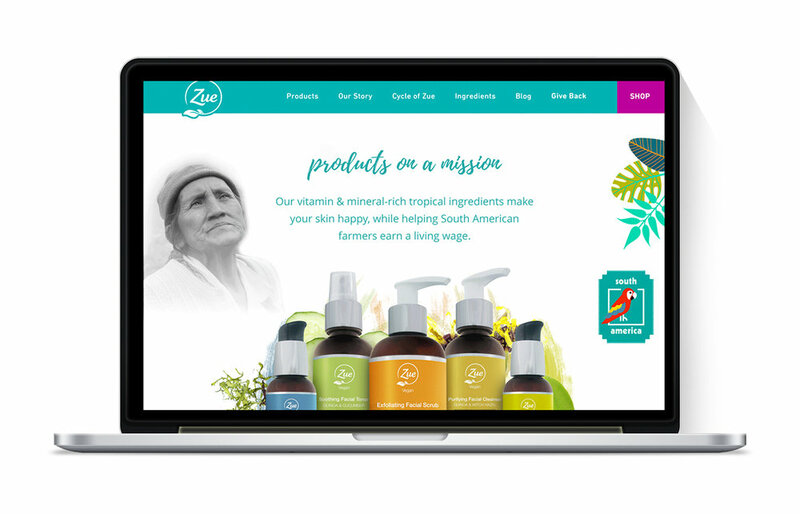 Zue Beauty is a part of this larger initiative, paying farmers they train a living wage (higher than the cocaine refineries), allowing tribal members to switch their crop of coca plants to products like quinoa. A more diverse set of crops increases the biodiversity of the land, but also protects the Paez people from the violence and instability of working for the drug traffickers. 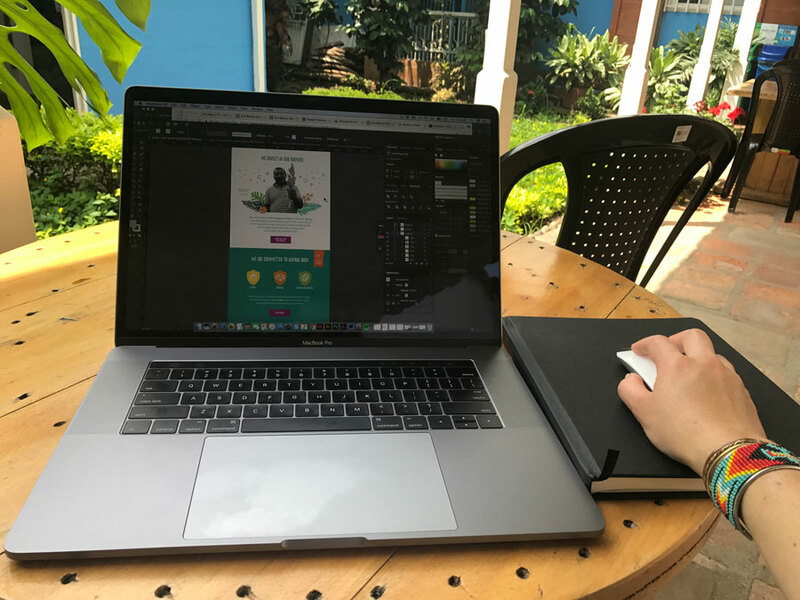 My role as a graphic designer on assignment in Colombia is to work with Zue Beauty to help them with design, branding and social media strategy in advance of a product launch with Whole Foods’ Mid-Atlantic region in the US. This is a big deal for this small, Colombian start-up. If Zue products sell well in the sample market, Whole Foods will sell the products nationwide. I arrive in Colombia eager to offer my design support, and to learn about Colombian history, culture, food and dance. Zue Beauty founder, Gabriel Maya, picks me up from my hotel on my first day in Cali. Since the volunteer assignment is only two weeks long, we head straight to the office to meet the team. The office is located in a seemingly residential neighborhood of Cali, relaxed with tree-lined streets. I am joined by another Farmer-to-Farmer volunteer, Nicole Opie who is going to be working with the Zue team on their website’s search engine optimization strategy. For a start-up, Zue already was way ahead of the game as far as design and branding. They had a professional logo with basic logo guidelines. They had package designs for all their products, printed marketing materials and a basic website. They had an in house team of two designers with strong design and illustration skills, Juan and Sebastián. From this strong foundation, we were able to determine what was missing and what needed work. I identified the components which needed the most improvement were the website and strategy/graphic assets for social media. The website was successful at telling the story of Zue and showing the products and farmers, but lacked a strong Home page. The website was inconsistent design-wise with printed marketing materials and an additional page (the Give Back page) was incomplete. With a project scope now defined, we had our work cut out for us. But first, it was Juan’s birthday, and the staff of six in the office, plus us two visitors took a break to celebrate. The office boasted a full kitchen, a photography studio, conference room and “play room” complete with a foosball table. Colombian coffee from one of the staff member’s family farm was always at the ready. Snacks and desserts were rolled out, balloons were hung, and we sang an extended version of the Spanish “happy birthday” song with a fireworks finale. A rare Colombian thunderstorm and hard rains pounded the office patio. It was a good first day. Nicole and I met for coffee and brunch the next morning to exchange ideas and make a plan for social media and content strategy (where our skill sets overlapped). We met at Tostaky, a quaint cafe in San Antonio with strong coffee, murals, wifi, and friendly waitstaff. I walked the short distance from my hotel, the fancy Dann Carlton. After our strategy meeting, I walked the 8 blocks back to the hotel, but I felt something wet on the back of my backpack. Upon examination, I discovered that my water bottle had leaked in my bag. Arriving back at the hotel, my 2 month old laptop computer which had been in the bag was on the fritz. The screen would flicker, the mouse was erratic, then everything went dark. It was day two in Colombia and my MacBook Pro had suffered water damage. Apple support recommended an endorsed Mac retailer in Cali, across town from my hotel. So, hours after the damage was done, I was trekking across town to drop my computer off to get the damage accessed. The “ishop” was in an expansive indoor/outdoor shopping mall complete with fancy shoe stores, food vendors and armed guards at every turn. The police presence in Colombia is significant, and the fact that the guards’ guns are always drawn is a bit unsettling. My Spanish is limited and terrible, but luckily there was Google Translate! The technician got a kick out of communicating via the technology, and even asked me friendly questions beyond what was needed to fill out the work order. He told me he would open up the machine, make a diagnosis, then email/call me with the verdict. This could take 3–5 days. 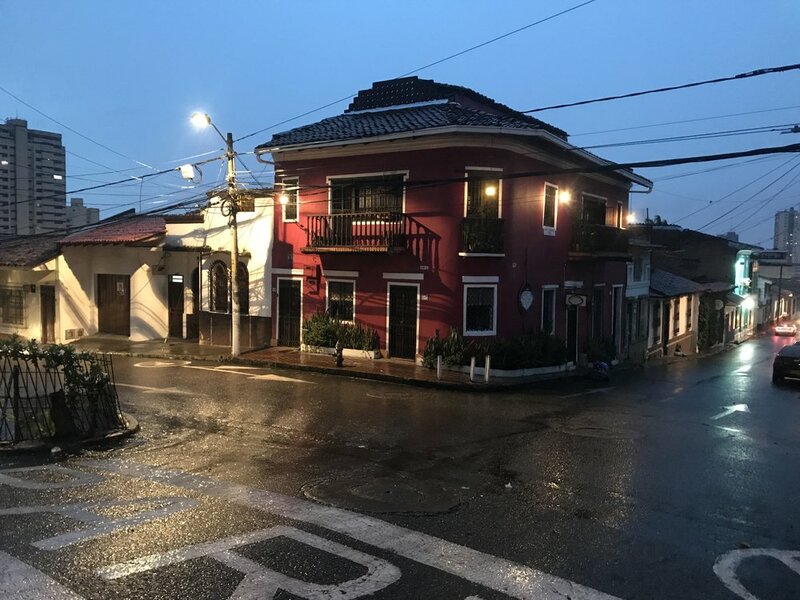 Now, I was in Colombia without a computer, fearful that the damage would be extensive and expensive, and unsure how I would complete the project. I broke the news to my client, Gabriel. Gabriel is smart, connected, young, jovial and brimming with positivity. He quickly re-assured me that he could get me a computer to use by the next day, but it was clear that I would lose the work I had done thus far. Frustrated, but trying to make the best of the situation, I met Nicole out for dinner and drinks at a salsa bar Mazao Park. I was stopped upon entering the bar and asked several questions in Spanish. Assuming there was a cover charge, or they needed my ID, I was surprised when they asked me what language I spoke, and then asked me to wait. Confused about what was needed from me, they finally called me over to a table where Nicole was waiting with two Colombian college students. Apparently, it was multi-cultural exchange night at Mazao and the staff was finding everyone a table based on what language they spoke or were interested in speaking. We spent the night dancing in between conversations with our new Colombian friends (English learners). The dancing at Mazao was modern and the music more varied than at other dance halls I would visit in Colombia. It was approachable and anyone could join in and follow along. We met at the office on day three. Luckily Nicole had content to present to our client, while I was having to start over. Gabriel gave me his brother’s computer to use for the next week. It was a PC (I am used to a Mac), it had Adobe Illustrator installed, but it was an older version than I was used to, and the software and the computer interface was in Spanish. I was finally ready to start over, but with adjusting to a new machine and interface, it was slow going. Using existing illustration assets, colors, fonts, and photography, I re-designed the interface for the Give Back section showing how the user progressed through the experience with each frame. The process was very collaborative. I showed design comps early on to the team at Zue and we walked through revisions and feedback. The team was mostly bilingual, but to make sure everyone understood, Gabriel would pause to translate. I would work from the hotel, but take an Uber into the office every few days to check in and review work. By Friday of the first week I had completed the Give Back section and was able to turn over the design files to the internal team so they could begin development. “The Chontaduro is a fruit with a potato-like texture, cooked and eaten with honey and salt,” the young guide on the walking tour says as we stood before a fruit stand overflowing with a bright red, oval-shaped fruit. “Would you like to try?” Of course I would, for one Colombian Peso (about 30 cents US). It was as advertised, rather bland and dense like a potato, but delicious with the dose of honey an salt. A group of us tourists were on a walking tour through the downtown core of Cali with Valley Adventours, an ecotourism company that offered a range of adventure tours as well as the basic, historical and cultural experiences. Our guide told us that 10 years ago we would not have been able to walk the neighborhood we were walking. The drug cartels in Cali inflicted terror on the city for many decades, making Cali unsafe for tourists and locals alike. Karina, the owner of the tour company tells the story about how her family fled to the US during those years, but as she was back visiting relatives in recent years, she started to see the city change as art and community spaces saw investment. Today Cali has been reborn, and you can see how the investments have paid off. Cali boasts a wide boulevard along the river that used to be a road, but has since been converted to a wide open community space for bikers and walkers. At Parque del Gato a giant cat sculpture (El Gate Rio by the artist Hernando Tejada) and many smaller cat sculptures each uniquely painted by a different Colombian artist offer an attraction. Tourists, families and Caleños (people of Cali) out for a jog wind through the park’s manicured hedges. The cat is a mascot for the city, which historically was known for a large population of strays. The street cats are fewer now, but can still be seen on rooftops, in alleys and hunting along the river. Cali’s crown jewel of the city is the Iglesia de San Antonio atop the San Antonio neighborhood. During the day you visit for the stellar view of the city and surrounding park. At dusk you visit for the social scene. Teenage Caleños are there to picnic, cuddle or smoke marijuana. Vendors line the walkways hoping to capture your attention. Families gather to take in a performance at the small outdoor amphitheater, or stop in to church. It is a hub of activity, even on these spring days with on and off rain. I was not prepared for Cali’s restaurant scene, the food quality and diversity of which would rival any major US city. While not many restaurants have much of an online presence, we quickly learned that there was no need to do advance research before going out to eat in the San Antonio neighborhood, and any restaurant you wandered in to was sure to please. Food was flavorful, savory, and made the most of local ingredients, but with a global perspective. From hipster coffee bar/breakfast joints to fine dining we tasted our way through the barrio. I even sampled the plate of the day a local, blue collar restaurant, where I sat before the woman who carefully prepared the same meal (4-courses) for all her guests. After completing the Give Back section of the website, I focused my attention on the Home page. The current Home page featured an outdated marquee and minimal information about the product. We decided that the products needed to be front and center and that the farmer story also needed to be told on the Home page. I re-ordered the information, provided emphasis on the product, and offered up some light copywriting to give a general sense for what the length, content and style should be. The design style of the Give Back and Home pages were drafted off of some existing elements from the original design as well as illustration and style elements from an existing brochure. My recommendation to Zue was that all their design work tie together and feel more consistent. To that end, as I worked I began to compile a document of brand assets and specs that would guide all future design work. As my first work week in Colombia came to a close, Nicole and I booked a Saturday tour with Valley Adventours to go horseback riding just outside of town. Edwin, our guide, driver and translator grew up in Queens, New York and recently moved back to Cali to be closer to his family and support Colombian tourism. Amidst a backdrop of sugar cane and lush rolling hills, I mounted a spry young horse named Rancho, and we headed out to explore the tropical landscape. Quickly the hustle of the city melted away, and the noise of traffic was replaced by bird squawks and a bubbling creek. We trotted through sugar cane fields and up to the tops of grassy hills, wet and muddy with red clay. We sampled guava from a tree, not quite ripe. We came upon several curious looking cebù cows — a breed with comically adorable floppy ears and a camel-like hump. Just before reaching the hilltop, our guide diverted from the path to check on what he thought was an injured cow. He called us down to join him to show us what he found. Instead of an injured cow, it was a newly-birthed cebù calf. With doe eyes, giant floppy ears and his legs folded beneath him, he eyed us with curiosity while mom beckoned him from nearby. The baby still had the umbilical cord attached and was wet with fluid. He posed for our photos and as we started to ride off, he stood up on his wobbly legs and followed us. From the hilltop, we watched as he was re-united with his mother. For the first week, I stayed at the upscale Hotel Dann Carlton as was booked by my client. But by week two, I was ready for a new environment, where I was more likely to meet and befriend other travelers. I checked myself into Hotel Tropica, a laid back hostel where I booked the apartment suite. I had my very own patio and hammock, but mostly worked from the shared courtyard. The hostel advertised their salsa classes, and on two nights I joined in, once in a group class and one private lesson. Salsa dancing is a high art in Cali and it seems that most Caleños start at a young age. The style in Cali is faster than the Cuban counterpart and the steps are backwards instead of forward. I learned that salsa dancing originated in New York City from Cuban and Puerto Rican communities, but Cali has since taken on the title of “work capital” of salsa. Armed with some dancing basics, myself, Nicole and a few friends we picked up along way tried our hand at dancing in some of the salsa dance clubs. Tin Tin Deo was a great low-key club to start in. It was filled with tourists and locals and plenty of tables if you want to just sit and take it all in. Dancing is very traditional, the man usually asks the woman. I danced with Colombians and tourists alike, and found myself apologizing upfront to my future dance partner. Most Colombians are excited to teach their craft. La Topa was a “next level” club where we found ourselves doing more watching than dancing. The dancers were performers there, practicing their perfectly choreographed moves, switching out partners, crowds forming in circles around them, cheering them on. On a busy night, it was packed with Caleños young and old dancing until past 2am, drenched in sweat. Upon closing, the cheery crowd flooded the streets, buying late night street food from vendors and coordinating taxi rides home with friends. We kicked off week two with a brainstorming session about the Whole Foods campaign roll out. Zue Beauty had booked a marketing company to represent Zue at a table in the store, hand out samples and sing the praises of Zue Beauty products to potential customers. We talked through what the goals were of that engagement and what actions we wanted customers to take (sign up for Zue’s email list). We discussed what visuals best represent the company. The samples were to be handed out in a small, decorative cloth bag and I was tasked with designing a brochure to be inserted. We decided that the brochure should align closely in design and content to the newly designed home page and focus on the farmer story as well as give exact details on how the Give Back program works. I was able to utilize existing fonts and textures for the design of the 4-panel promotional roll fold piece. The designer from Zue showed me paper samples of sugar cane paper, widely available in Colombia and we decided that would be a great choice for the brochure. One of the missing pieces from the existing brand story was that the designs were lacking a Colombian feel. While the company was featuring Colombian farmers, the fact that Zue was a Colombian company and that South America is where all the ingredients originated was lost. Americans crave tropical products and I suggested that they develop an additional component that gives the brand a more tropical feel. I provided several examples of tropical plant illustrations that I thought could be useful and Sebastián, the talented in house illustrator set to work on working up new assets. To support this messaging, I designed a “stamp” graphic to be used on the home page and in the brochure. Featuring a parrot, the words South America and the colors of the Colombia flag, the stamp gave the designs a proper identifier as to the product’s origin. We encouraged the staff to be proud of the Colombian roots and make sure that future design work represents the product’s tropical ingredients. Writers for hire in Poet’s Park are available at all times serve as a notary, help draft contracts, or write poems. The honks increased in frequency and density around us. We were in an Uber on the way back to San Antonio from the Zue offices and traffic around us had come to a screeching halt. What was normally a 20 minute ride was bordering on 40. Our driver spoke no English but desperately tried to explain the situation to us. We understood that it was something to do with a taxi. As we slowly wound our way around back roads, we caught a glimpse of what was causing the situation on the main road. Swarms of taxis, police (in cars and armed on the streets) were blocking the entire 4 lane road. What we later learned was that we had come upon a taxi protest. Taxis from all over the city had banded together to create a 4 lane road block. Why? To protest Uber. The story was very familiar, and has played out in nearly every city the technology disrupter has emerged in. 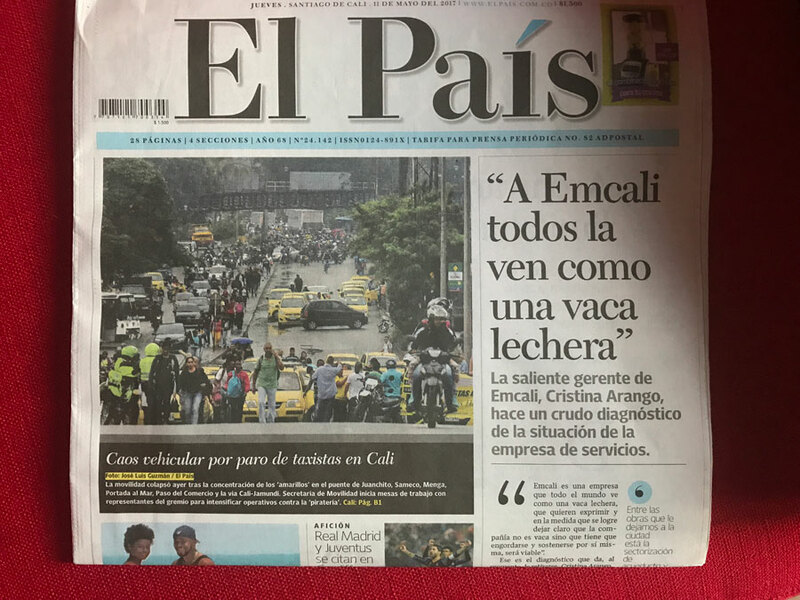 Taxis in Colombia are everywhere, but they are a cash only affair and there have been many instances of kidnapping by taxi drivers or by those posing as a taxi drivers. Taxi drivers have had a bad reputation for taking a longer route or over-charging tourists. For this reason, our client recommended we take Uber everywhere (no, there was no Lyft operating in Cali, I checked). I noticed right away that the cars did not have the Uber branding present on them anywhere, so I had to double check with the driver that he/she knew my name before hopping in the car. Drivers made sure we sat in the front seat, rather than the back and one driver even told me, if anyone at the hotel asked me who he was, to tell them I was his friend. It seems Uber drivers were under threat, by what appears to be a large and imposing taxi union. Amid the honks, our driver expertly navigated around the protest and got us home. “Let’s hear it for Oregon, Wisconsin and Tennessee!! !” A chiva bus DJ shouts into the mic in Spanish. A rowdy crowd on the bus cheers including us, the three American women representing each of these states. We are on a chiva (a brightly painted party bus) complete with a DJ, sound system, disco lights, dance floor, a driver and 20 members of the Rodriquez family slowly making our way, through the city of Cali. The family is celebrating the 70th birthday of Fernando, the sweet, fun-loving patriarch. We were invited to join the party by Fernando’s son, Ricardo, who Nicole and her American hostel mate, Jenny, met out dancing the previous night. Ricardo (Rick) was in town visiting for his father’s birthday from Chicago. Only Rick, his brother, and Fernando spoke English, but all the aunts, uncles and cousins embrace us anyways, offer up the aguediente (anise-flavored spirit, made from sugar cane that translates as “firewater”) and invite us to dance. As the chiva loudly progresses through the city, the salsa music is on blast and the bus riders dance despite the hazards of doing so on a moving bus. Periodically the DJ would interrupt the music to give a city tour, and announce the locations of where all the participants are from. Fernando takes a break between dances and leans in to apologize for his drunk nephew who has been shamelessly hitting on the three of us American women. He dishes to Nicole, “He is an attorney for a famous cartel leader in Mexico, that is his bodyguard…” he points to a man who has been serving the drunk nephew water in an attempt to lull the effects of the alcohol. We felt very welcomed by this loving family, and so when an invitation was extended to us to attend Fernando’s birthday party part two, days later, we accepted. 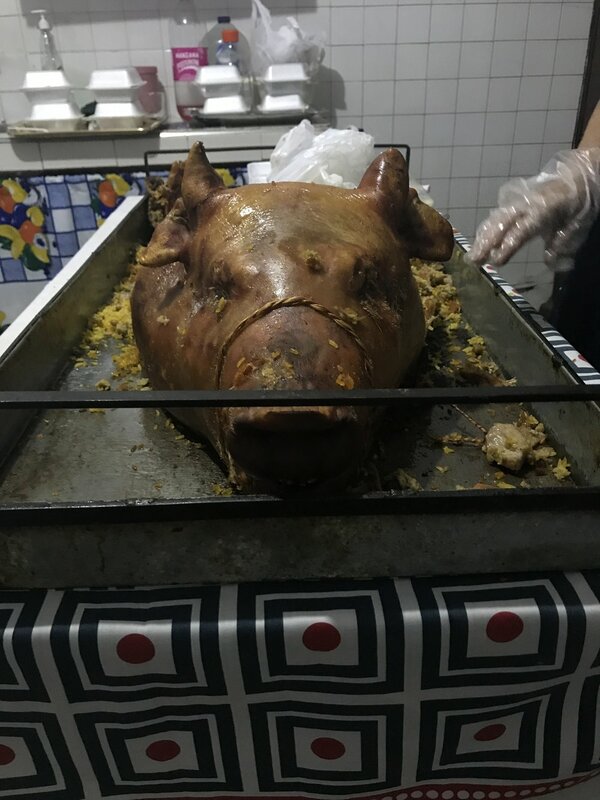 This party was at his home and would feature 70s disco attire, a whole roasted pig, and a five piece band. When the three of us arrived to the party, late as is Colombian fashion, our arrival was announced on the loud speaker. We were treated like honored guests. Again, I heard the extended version of the birthday song in Spanish along with a calling out for each decade Fernando had lived. There were touching speeches, aguediente passed around and of course, more dancing. Fernando and Juan weren’t the only ones who celebrate a birthday during this two week period in May. Nicole and I both had our birthdays in Colombia as well. On Tuesday May 16th, my birthday, I received the best news of the trip — my computer was fixed and ready for pick up! Gabriel accompanied me on the journey to pick up my laptop to ensure everything was OK. The tech at ishop said there was water damage but that they cleaned it up an it was not extensive. They dried it out, put it back together and here it was, good as new. Since they claimed they didn’t have to do much, it was no charge. I was so grateful to be back on my own machine, and ready to finish up the last week of work. Upon completing the website re-design and brochure project for Zue Beauty, I moved on to social media templates and compiling a final brand guidelines document for future design work. Social media was an area I thought could use the most improvement and Nicole and I felt the brand needed to move away from generic lifestyle, feel-good posts that had nothing to with the brand to more targeted images/content that related directly to one of the core brand values. We created a litmus test for content. Does it celebrate women? Does it relate to the product? Does it talk about Cycle of Zue? Does it celebrate Colombia? Does it profile a customer? Does it reflect a core value? If not, it should not be a part of your social content. When developing social content, Zue should choose a theme, a content type (profile, product, lifestyle, etc) and an action. Nicole and I offered examples for how to engage with an audience including call for audience content and customer profiles. I came up with the hashtag #uniquelyzue and gave examples for how that tag can be used to highlight customers and showcase lifestyle. We discussed the difference between evergreen (ongoing campaigns) vs promotional campaigns that are short term and encouraged the team to develop an editorial calendar for social and blog content. I provided many visual examples of successful social campaigns in the US from Dove’s “Real Beauty” campaign to REI’s “Force of Nature” and called out what was successful about each. Finally I designed a few Instagram graphic examples to be used as a template for future content. By Friday of the last week of our Colombian trip, I presented the final brand guidelines document to the team, and packaged up all the assets to share back with the designers. I believe the team is well positioned to have a successful product launch in the states. I look forward to seeing how Zue Beauty evolves and hope to find their products on the shelves of my Whole Foods soon. My last Saturday in Colombia was a hot one! Our amazing tour company friends at Valley Adventours helped us hire a car and driver for the afternoon, and he took us on a journey up into the mountains around Cali. “Bring a jacket,” they said, and they were right. As soon as we got into the hills, the air quickly became brisk. 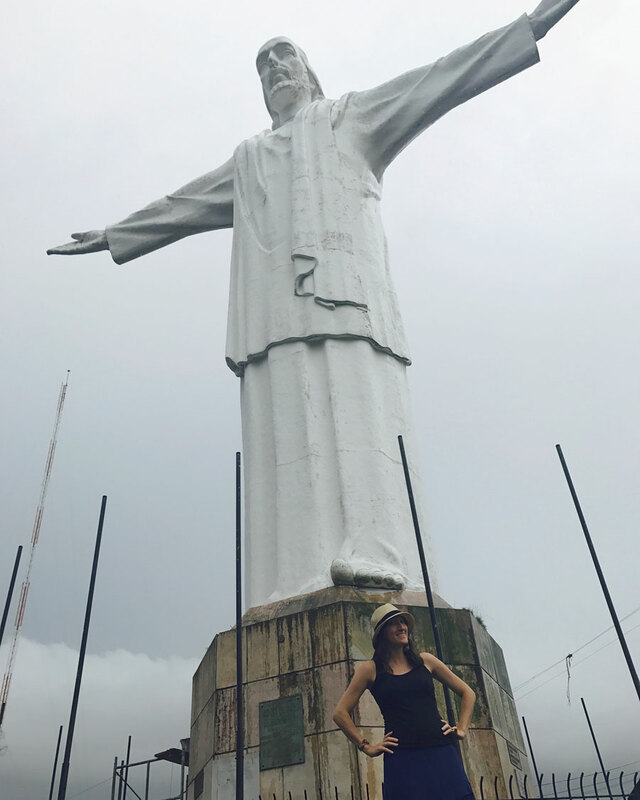 We stopped at several overlooks along the way where we could see the great statue of Cristo Rey overlooking the city and the city itself in the distance. We made our way past a row of adorable goat milk and cheese farm stands all lined up in a row with their goats (dressed in adorable outfits) leashed next to them. We stopped at the village of Felidia to get a glimpse of small town Colombia with its central church and square. Finally we ended up at our destination, Kilometro 18, a hotel/resort/restaurant zone with beautiful gardens and killer views. Today our view was cloudy, but the gardens did not disappoint. 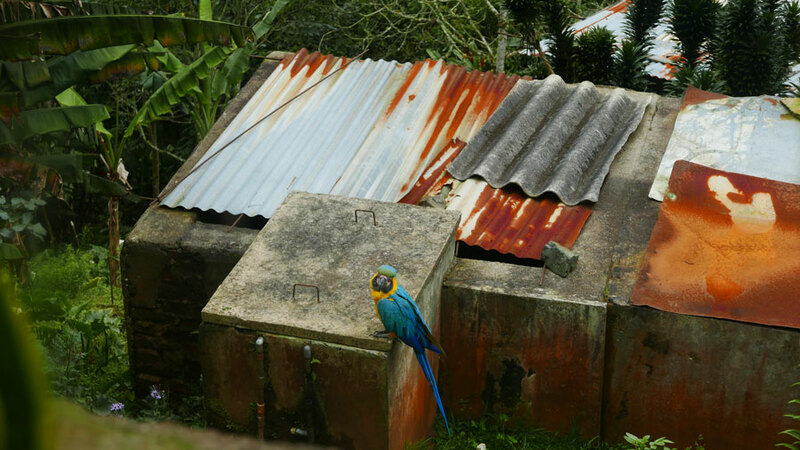 We ate a traditional Colombian lunch and made eyes at a parrot who was “free range” and belonged to a neighbor. 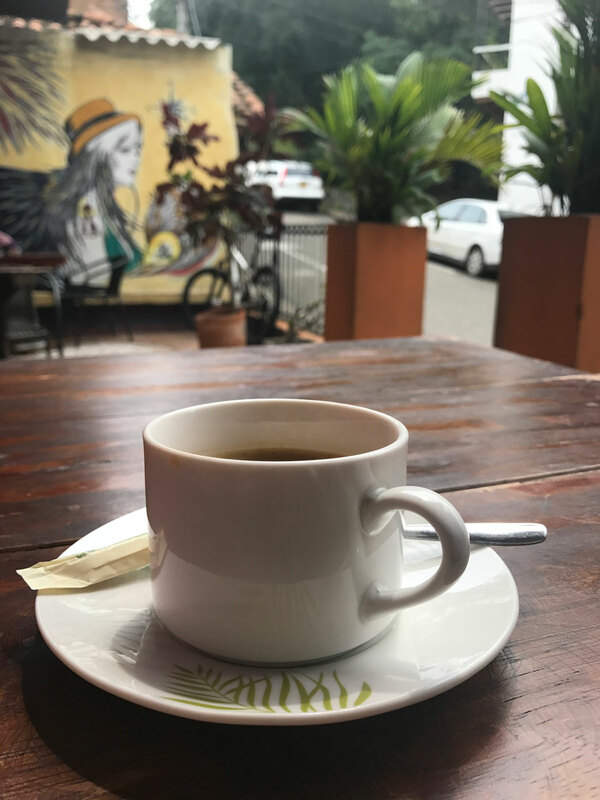 After we wound back down the mountain back to Cali, I went on a sunset walk to the Loma de La Cruz, a park full of artisan vendors, alive with weekend excitement. I felt love for the city and incredibly lucky to have had this experience, met these people and contributed to this Colombian moment. Thank you to Partners of the Americas and Farmer to Farmer for inviting me on this incredible volunteer experience.